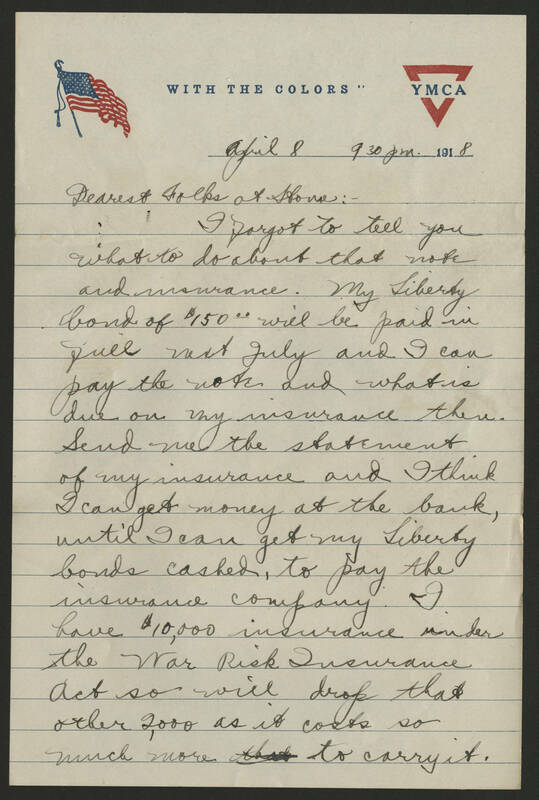 April 8 9 30 p.m. 1918 Dearest Folks at Home:- I forgot to tell you what to do about that note and insurance. My Liberty bond of $150.00 will be paid in full next July and I can pay the note and what is due on my insurance then. Send me the statement of my insurance and I think I can get money at the bank, until I can get my Liberty bonds cashed, to pay the insurance company. I have $10,000 insurance under the War Risk Insurance Act so will drop that other 2,000 as it costs so much more to carry it.